This rugged, all weather Crossed Elements, Yagi Antenna is designed for Circular Polarization. Special mounting hardware is fixed at the centre of the yagi antenna for mounting on a round pipe of 1-1/2 inch O.D. The yagi antenna when packed, comes with elements removed from the antenna boom for ease of packing and transportation. It can be assembled at site with use of simple hand tools. The mounting hardware supplied is of Stainless Steel. 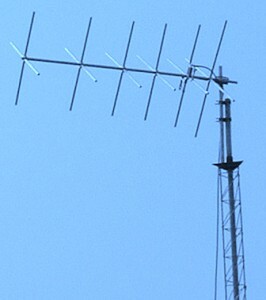 The yagi antenna uses a GAMMA matching feed, eliminating the use of folded dipole. The antenna termination uses N-Female connector fixed on the antenna dipole. The 90 degree delay harness cable comes with impedance matched molded joints for low VSWR and require no protection against weather. When the Antenna is mounted on the mast, the yagi crossed elements make an angle of 45 degrees with respect to horizontal plane. Yagi antenna can be mounted to work as RCP or LCP selectable by inter-changing the 90 Degrees delay harness cable.